All beef is inspected for wholesomeness by the U.S. Department of Agriculture (USDA)*, and is graded for quality and consistency. You’ve heard of Prime, Choice and Select grades – and Prime tops the grading scale. Marbling plays a big role in quality grades. Marbling – the little white flecks in beef – is key to flavor. The higher the amount of marbling, the higher the quality of beef. The Certified Angus Beef ® brand is incredibly flavorful, tender and juicy because of the high amounts of marbling in every cut. Q: How is beef graded? A: Independent USDA graders inspect cattle and label them according to the grading scale: Prime, Choice, Select and several low-quality grades. Q: How is beef selected for the Certified Angus Beef ® brand? A: The same independent USDA graders inspect black-hided cattle (typical of the Angus breed) and give it a grade. All beef considered for the brand must be the best Choice, or Prime, beef – truly the top of the scale. This top-quality Angus beef is then evaluated again, using the brand's set of 10 science-based specifications for marbling, size and uniformity. If it's good enough to make the cut, then it earns the distinctive Certified Angus Beef ® brand label. 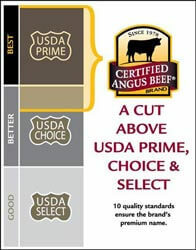 Q: What makes Certified Angus Beef ® brand Prime the ultimate beef? A: Quality, plain and simple. Only truly elite beef surpasses the USDA's stringent Prime standards, AND meets all 10 of the brand's quality specifications. Less than 1.5% of beef achieves the high standards of Certified Angus Beef ® brand Prime. And marbling is key to its incredible flavor and tenderness.